It’s beauty obsession week here at F4! What does this mean? It means we’ll be featuring our favorite products, regimens, blog superstars and makeup artists/hair gurus. First off, I want to scream to the hills about my love of Darphin products. I don’t use them all, but as I get older, I realized I cannot fall asleep in my makeup, even when that makeup is Bare Minerals. 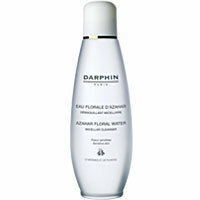 So, at night, I wash it all off with the super gentle and luxurious Darphin Azahar Cleansing Micellar Water. Give it a whirl! Stay tuned for a beauty EXPLOSION, my loves! Posted in beauty and tagged beauty, fierce, loveliness. Bookmark the permalink.